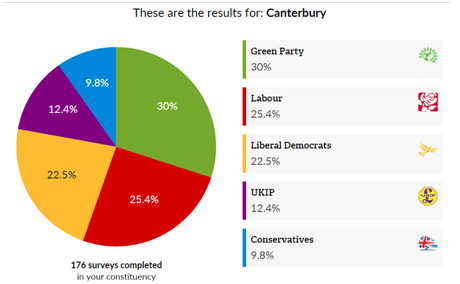 Last week’s launch of the 2015 Vote for Policies website has put the Green Party in first place with 30% in Canterbury after almost 200 local people took the survey. The website surveys people’s policy choices rather than party choices and calculates which party is most closely aligned to them. Stuart Jeffery, Green Party candidate for Canterbury and Whitstable: “Once again the Green Party is demonstrating that it has the right ideas and right policies for people.